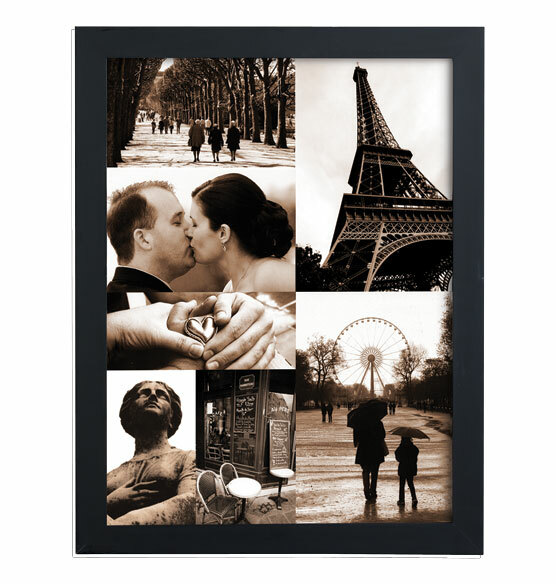 Send us or upload seven photos Black & White or Color, Horizontal or Vertical, up to 8" x 10" and we will design a 7 photo collage canvas for you. Your photos will be reproduced on canvas, stretched over a wood frame, ready for hanging. Unframed canvas measures 24" x 18". (We cannot accept slides, negatives or copyrighted photos/art). Sorry, no gift boxing. From boxed photos to beautiful collage! Treasured family group photos, kind of old and kept in an old envelope (not acid-free) so color and sharpness had deteriorated. Exposures enhanced the colors and sharpness of the photos and created a beautiful collage that we treasure and now can enjoy every day. We love this collage canvas and update it with family photos every few years!